Physical characteristics: The white-tailed tropicbird is the smallest of the three kinds of tropicbirds. Male and female birds look alike. The adult is 29 inches (74 centimeters) long from bill to end of tail, and about half that length is the tail. Its wingspan is 37 inches (94 centimeters), and the bird weighs 11 ounces (312 grams). The trop-icbird's feathers are mostly white, but it has black markings on the upper wings, and a black eye-stripe. It has a long white tail with a black stripe on top and a down-curved bill that is orange or redorange. It has short legs and its feet are webbed. Since the tropicbird's legs are set far back on its body, it is a good swimmer, but it is awkward on land. Tropicbirds do not have bare skin pouches on their throats the way pelicans and other birds in their group do. they are rarely seen near land. Instead, they spend the rest of their lives flying over the ocean or sitting on the water. Habitat: The islands these birds nest on are all in warm tropical areas. The habitats they prefer are rocky cliffs where land predators are not able to reach them. They go on long trips over the ocean, as far as 75 miles (120 kilometers) from the islands while searching for fish. When they are not nesting, they stay far from the islands and continental shorelines. They are usually found in water with warm temperatures between 74.8 and 76°F (23.8 and 24.9°C). Diet: The main foods of white-tailed tropicbirds are flying fish and squid. They also eat other kinds of fish. Tropicbirds can catch and eat rather large fish for their size, up to 18 percent of their body weight. That would be like a 100-pound, or 36-kilogram, person eating the meat in 72 hamburgers. The birds usually plunge into the water from the air, but they are not deep divers. They find their food near the surface of the water. They can also catch flying fish in the air. Behavior and reproduction: White-tailed tropicbirds are excellent fliers and can stay in the air for a long time. When they are flying, they have a rattling call. They are built for life on the ocean, and are clumsy on land. Their legs are set far back so they shuffle along on their breasts and push themselves with their wings. They cannot stand upright and fall forward on their bellies. Sometimes they stab their bills into the ground and drag themselves forward. Before breeding begins, many pairs of white-tailed tropicbird hover over the water near the nest site. They call, "kyep-kyep," and flap their wings in unison. They may fly higher than 300 feet (94.4 meters). The top bird in a pair sometimes hangs its long tail down onto its mate below. When one bird in a pair flies to a nest site, the other one follows. White-tailed tropicbirds choose nest sites that are out of the direct sun. They like crevices in rocks or ledges under overhanging rocks. They also nest on sandy spots under bushes. The nest is just a shallow scrape in the ground. The birds that are able to use holes in rocky cliffs for their nests are quite safe from predators. The birds nesting on the ground try to defend their nests from rats and other predators with harsh screams and sharp pecks. The female bird lays one egg, and the parents take turns keeping it warm. When white-tailed tropicbirds hatch, their bills are a bluish color. The parents regurgitate, spit up, food into their own mouths, and the chicks eat from their open bills. Young birds grow speckled feathers on their backs, and their bills turn yellow. They leave the nest before they are three months old, and they do not practice flying before they leave. White-tailed tropicbirds and people: Bird watchers sometimes travel thousands of miles to see white-tailed tropicbirds. They also have a loud, shrill scream that reminded sailors of the whistle blown by a ship's officer. The officer was called a bosun or boatswain. That is how the bird got the nickname bosun bird. Before 1880 on the island of Bermuda, white tropicbirds were hunted to supply hat-makers with feathers. When the birds became scarce, the birds became a protected species. The tropicbird is considered a national bird of Bermuda and its picture appears on postage stamps and on the 25-cent coin. Alsop, Fred J. III. Smithsonian Birds of North America. London and New York: DK Publishing, Inc. 2001.
del Hoyo, Josep, A. Elliott, and J. Sargatal, eds. Handbook of the Birds of the World. Vol. 1, Ostrich to Ducks. Barcelona: Lynx Edicions, 1992. Fleet, Robert R. Red-Tailed Tropicbird on Kure Atoll (No. 16). Washington, DC: American Ornithologists Union, 1974. Haley, Delphine, ed. Seabirds of Eastern North Pacific and Arctic Waters. Seattle: Pacific Search Press, 1984. Harrison, Peter. Seabirds, An Identification Guide. Boston: Houghton Mifflin Company, 1983. Hosking, Eric. Seabirds of the World. New York: Facts on File, 1983. Soper, Tony. Oceans of Seabirds. London: David and Charles Publishers, 1989. Friend, Tim. "Courtship is Quite a Display." USA Today (January 14, 2004): D06. Harrison., Craig S. "Tropicbird Song." Sea Frontiers (January-February 1994): 44-52. Lee, D.S. and M. Walsh-McGehee. "The Birds of North America, White-Tailed Tropicbird, No. 353." Cornell Laboratory of Ornithology and The Academy of Natural Sciences (1998): 1-24. Veit, Allison C., and Ian L. Jones. 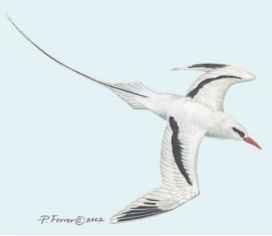 "Function of Tail Streamers of Red-Tailed Tropicbirds (Phaethon rubricauda) as Inferred from Patterns of Variation." The Auk (October 2003): 1033-1044. "Amokura, the Red-Tailed Tropicbird." New Zealand Bird Gallery. http://www.nzbirds.com/Amokura.html (accessed on April 25, 2004). "Red-Tailed Tropicbird." Midway Atoll National Wildlife Refuge. http://midway.fws.gov/wildlife/rttr.html (accessed on April 7, 2004). Roberson, C. D. "Tropicbird Identification." MontereyBay.com. http:// www.montereybay.com/creagrus/tropicbd-id.html (accessed on April 25, 2004). "Tropicbird" Wikipedia, The Free Encyclopedia. http://en.wikipedia.org/ wiki/Phaethontidae (accessed on April 25, 2004). Frigatebirds (FRIGG-it-birdz) are unusual seabirds. Their feathers are not waterproof, so they try to avoid getting them wet. They have mostly dark feathers, although many frigatebirds, especially the females and young ones, have white feathers on their breasts, and some young birds have white heads. 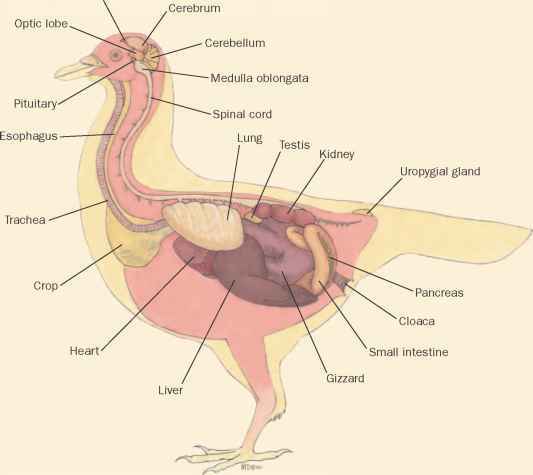 The birds also have short legs, webbed feet, forked tails, and the males have an inflatable pouch on their throats. Frigatebirds have extremely long, pointed wings. In fact, they have the largest wings in proportion to their weight of any other bird. They also have exceptionally strong breast muscles that work together with their wings to make them powerful, acrobatic fliers. Female frigatebirds are somewhat larger than the males. The birds are between 30 and 44 inches (75 and 112 centimeters) long from their bills to the end of their tails, and their wingspan is between 69 and 91 inches (176 and 230 centimeters). They weigh up to 3.3 pounds (1.5 kilograms), and almost half of their body weight consists of breast muscles and feathers. Magnificent frigatebirds fly above the warm ocean water and breed on tropical and subtropical islands all around the world. The other four species of frigatebirds are more rare, and each species breeds on only a few remote islands.